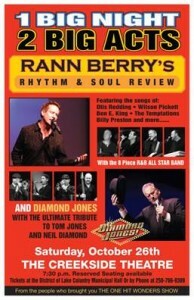 RANN BERRY’S RHYTHM & SOUL REVIEW With the 8 Piece Show Band. DIAMOND JONES with his Tom Jones and Neil Diamond Tribute. The Creekside Theatre welcomes back Rann Berry who recently sold out not 1 but 2 performances of his “One Hit Wonders Show”. This new show features the best of Rhythm & Soul music, including the songs of artists such as Wilson Pickett, The Temptations, Ben E. King, Otis Redding, Billy Preston and many more. Also sharing the night of entertainment is “Diamond Jones” and his tribute to Tom Jones and Neil Diamond. ( Many of you saw Diamond Jones opening for the One Hit Wonders Show ). Tickets $33.00 Includes all service charges & Taxes.